This recipe featuring one of the world's most interesting vegetables - eggplant - was surprisingly quite tasty. Maybe that's because most of it is scooped out...and then filled with a mixture of spicy salsa, soy burger crumbles (which adds a nice meaty texture), and hominy, with bread crumbs to hold everything together. This is "nouveau" Mexican cuisine at its best, almost a different (yet similar) take on a stuffed peppers. A hint of cilantro provides that delicious flavor common to so many Mexican dishes. 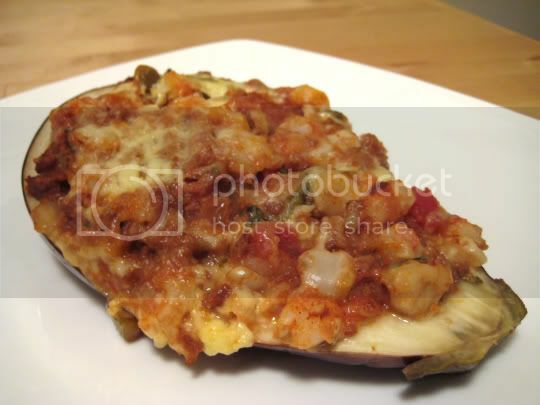 The stuffed eggplant is topped with shredded Monterey Jack cheese and makes it yummy, melty, and cheesy. With so many spicy and savory flavors, you barely even taste the eggplant, so it just provides a nice shell for the stuffing and a bit of a chewy texture. I think even the simple filling alone would be wonderful in tacos, burritos, or over rice and served with a side of chips and guacamole. In fact, some sliced avocado would probably be a wonderful addition to this recipe. Leftovers were OK, but definitely best eaten hot out of the oven (or for 1-2 days after). Make again? Yes...this could be a great recipe to introduce to eggplant-phobes.